The Alliance has dropped Halifax from its AL6 service effective December. Changes announced on the 26th, have a new routing of La Spezia –Genoa –Fos – Barcelona – Valencia – New York – Norfolk – Savannah – Miami – Algeciras –La Spezia.The New service will be combined with the Oceans Alliance Amerigo Service, and each alliance will provide 3 8000TEU vessels for a total of 6 in rotation. Since the Service began in summer of 2017, the routing has been Salerno – Livorno – La Spezia – Genoa – Fos Sur Mer – Halifax – New York – Norfolk – Savannah – Salerno and is served by 5 smaller K-Line vessels (Brevick Bridge, Budapest Bridge, Berlin Bridge, Bilbao Bridge, and Brotonne Bridge) at Fairvew Cove. ZIM markets the AL6 service as ZCI, and in a strengthening of the alliance, will be adding the Livorno stop to its ZCA Service which already calls in Halifax, and is now being Marketed by the Alliance as AL7. In the end, while this represents a loss of a weekly call to Halifax, the total TEU’s will likely remain the same. 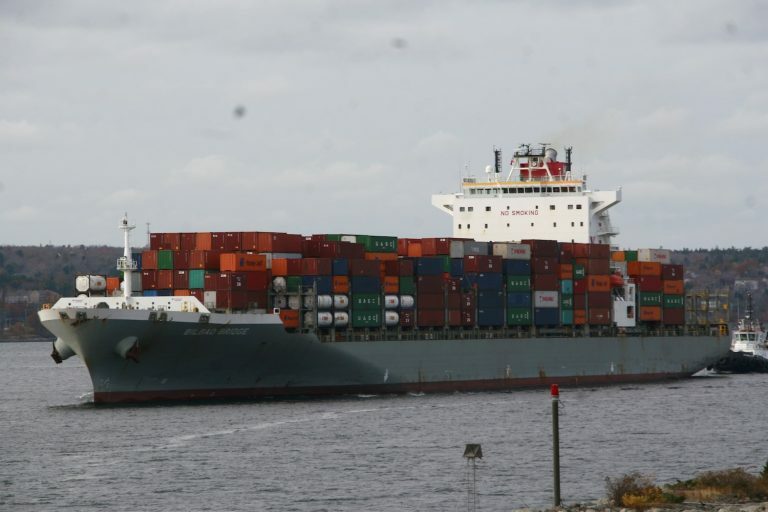 This entry was posted in container ship, The Alliance, ZIM on September 28, 2018 by Peter.